bolley (Homepage) wrote: VERY nice shot! 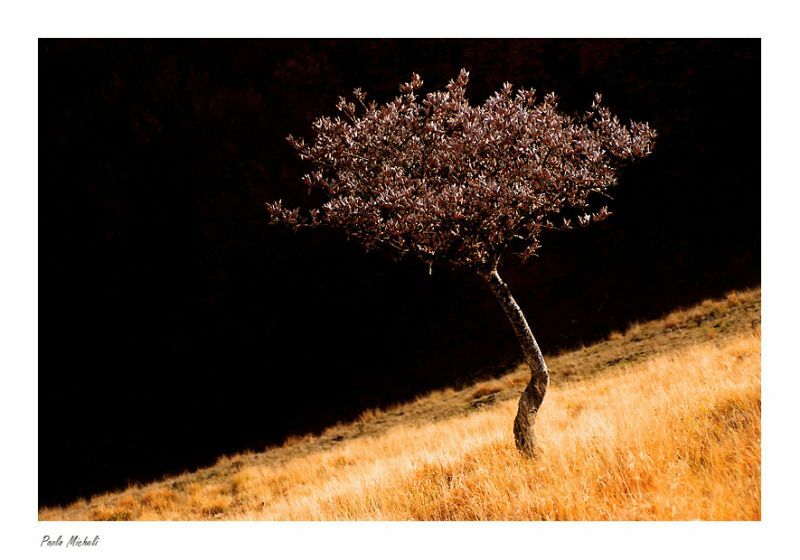 Like the enlightened grass and the black background of the tree at the same time! Timothy West (Homepage) wrote: thats so cool hows the land is tilting yet the tree looks right..
claire (Homepage) wrote: stunning in its simplicity. wow. Olivier (Homepage) wrote: Beautiful. I love it. Vincenz (Homepage) wrote: Nice angle and somehow mystical with the black sky! ignacio guerra (Homepage) wrote: i really like this picture! regards! Luisa (Homepage) wrote: You also isolated the tree gorgeously!!! And the slope in diagonal adds a special touch. Congratulations. Miguel Hau (Homepage) wrote: I love this tree. Great contrast. Asgardr (Homepage) wrote: Simple treatment great effect! Omar (Homepage) wrote: Wow, great composition, the contrast ist beautiful. Olivier (Homepage) wrote: Bel effet de contraste et de diagonale. Arjan - PlasticDaisy (Homepage) wrote: I don't know how you do it but every visit to your site is a treat! Another winner! John Maslowski (Homepage) wrote: The angle definitely has transformed this into a great composition. Excellent colors and tones that contrast very well with the dark background. Very well done. petitlouis (Homepage) wrote: Wonderful treatment, fine image ! Tom (Homepage) wrote: The background's a bit dark for my taste but I love the composition. Al (Homepage) wrote: Nice perspective! Elaine- (Homepage) wrote: wow, what an astonishing photograph! i love the angle lol and the black is so impossible! just great!!!!! grant (Homepage) wrote: striking photo. the black sky is surreal. ocorti (Homepage) wrote: very nice ! I just love it. Light is perfect and the subject is renderred eperfectly in its simplicity. Claus Petersen (Homepage) wrote: Superb isolation of the subject, and beautiful work on the colors! beanow (Homepage) wrote: What splendid picture! They blacken the idea of slit frame on half - super! Good work! Laurie (Homepage) wrote: A very interesting photo. The dark sky is so intriguing with the brightly lit tree and landscape. Interesting angle too. Giovanni (Homepage) wrote: Bellissimi la luce e i colori. Il fondo scuro mette in risalto l'albero. Molto bella anche l'inquadratura. Polydactyle (Homepage) wrote: Wow! I like it a lot. The colors, the light, the background and frame. Bravo! sherri (Homepage) wrote: What a beautiful little tree. Love the tilt. Love the colors.